**Many thanks to Medtronic for sponsoring today’s post and inspiring me to give back to my community! If I gave you $100 to use to give back to your community in some way, what would you do with it? It’s an interesting question, isn’t it? I want you to think about it because I have $100 to give away to one lucky winner! You must leave a comment telling me what you would do with the $100 to be entered to win. If you need ideas, you could start by visiting the Live On. Give On. page and read about what the 2014 Bakken Invitation honorees are doing. So what is The Bakken Invitation? Earl Bakken is one of the co-founders of Medtronic and has received extra life as a result of medical technology. The Bakken Invitation is all about the inspiring people from all over the world who have overcome a life changing medical challenge with the help of medical technology and are using their extra life to give back. Each of the selected honorees designates a charity to receive a $20,000 grant. Those are just a few of the things I do to help make a difference in my community. 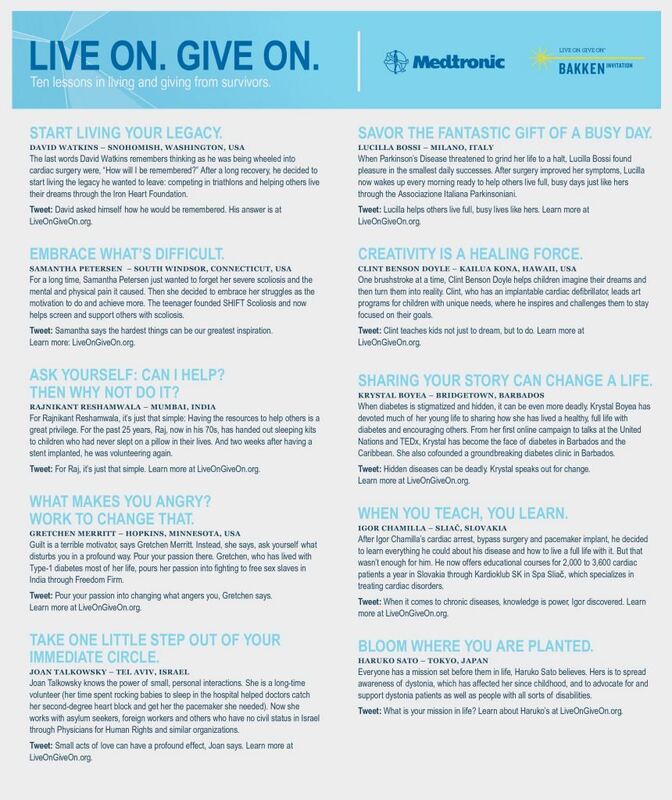 Use the following ‘Ten Lessons in Living and Giving from Survivors’ infographic as inspiration for finding ways to give back to your own community. So tell me what you would do with the $100 to give back to your community? You must tell me in a comment to be eligible to win. **Deadline for entries is 12/30/2014. Good Luck! Wonderful post Cheryl! I especially love the giving used cell phones to soldiers so that they can call home. As the mom of a Marine I can't tell you how important that is. Thank you to you and your family for your service. My old phones may not be much, but it feels like I am contributing in some way to helping someone keep in contact with their loved ones. I love your post. It is a great reminder to all. I love the way you help and give back to community. I feel that best thing is to volunteer time. As one is giving most important thing. You are right that each penny counts. I hope that feelings of sharing and giving will prevail through out the year. Thanks for a nice share. I also like Liveonegiveon efforts and I am truly inspired by this post. Well about what I will give to community. I feel that if I win then I will buy books for some kids whom I know , who can not afford books for their school. That's a great idea! Love it! I'd probably support my local animal shelter in some way. I'm a sucker for the homeless pups and kitties! You and me both. All my 'fur children' are rescues from shelters. All of these people are such an inspiration to me. This time of year, a lot of kids are taken care of with the Toys For Tots program. Children are so important to me, along with senior citizens. I would love to use this money to create care packages for people in my grandmother's nursing home. A small card, treat, or little trinket would really brighten their day. Another wonderful idea! Love it! I'd donate it to a soup kitchen that is fighting a legal battle to keep operating in a neighborhood who feel that there presence is bringing down their home values. This priest has been feeding the homeless for many years. What a great idea Cheryl. It sure does bring awareness to everyone this time of year…we are all so lucky. I really dislike it when good people are punished for doing the right thing. I would purchase diapers and formula to donate to our local pregnancy support center. I would use the money for more seeds for the garden to give more. What a blessing you are to your community! Would use it to help poor children. Believe it or not, poverty is increasing in Sweden and many children are growing up in poor families. Poverty is everywhere. I wish it were not the case. This is a no-brainer for me. I would give the $100 to the Idaho Humane Society. I am going to donate to local food shelves and adopt a family to help with holiday wishes and meals. Adopt a family… Love it! I would give it to our local United Way. They have been helping families pay their electricity and fuel bills and the need is so great they are already out of funds for this purpose. This is such a great post – we need more of these, not only to raise awareness but also to let us realize how blessed we are. I agree. Most of us truly are blessed. It's sad that so many families have need of the United Way. I like to donate food to local shelters a lot and I'd use the money to purchase a lot of food to donate. I would shop sales and use coupons to get the most bang for my buck and gladly give it to those that need. I had not thought of using coupons along with the funds. Great idea! What a great idea Cheryl & I had missed this post. I would give the $100 to our Local Animal Shelter. Animal Shelters need all the help they can get. All our fur children are rescues so I really appreciate those shelters. I have always thought that the local food banks are the best places to make a donation. I wish they were not needed, but they are a great place to invest the funds. What a wonderful post, and here's another thing to remember to donate – eyeglasses. As far as where I'd donate the $100 in my community – I tend to focus on our food bank during the holidays, but since I'm an animal lover I always through in some animal food as well because they work with the humane society. I had forgotten about donating eyeglasses. I have donated many pairs of them during my lifetime. Humane Society is also a great place to donate to. I love this idea! It's so easy to say that you feel like you were saved for a purpose when given another chance at life. It's another thing to figure out what that purpose may be! I would probably combine the $100 with my couponing skills to donate food to our church's food pantry. Finding a purpose, easier said than done in many cases. Food pantry is always a good choice. Great idea, so glad you're doing this, Cheryl. I've noticed many stores and businesses in my area are donating to food banks, which are always in need. As well, gift drives for children and teenagers – tweens are hard to gift, so gift certificates are encouraged. Love that this season brings out the generosity in all of us! So many people are in need that it’s hard to chose just one thing to do with the $100. I think the most practical thing I’d do is feed the hungry at the local shelter. Instead of simply giving them the money, however, what I’d do is visit two stores: the Dollar Store and the Bulk Zone, as these are the two cheapest places to shop for food, and then I’d drop off the purchases at the Shelter. The Dollar Store is great for buying canned goods, and the Bulk Zone is great for staples like flour and sugar. Not only will they appreciate the food items, but it would save the people who run the shelter from having to go out and get them themselves. They are busy enough as it is. Great post! I'm putting together an event here in my local town in January as it is Stalking Awareness Month. I have a lady with a concession store who has already put two large bags of clothes together so we can donate them to people who have survived domestic violence/stalking. 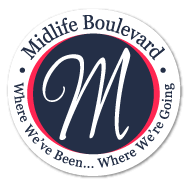 We are going to have music from DV survivor Simply Mary, some dance moves from guest Julie Buhite. There will be someone teaching self defense. I want to raise awareness and give back through a fun and uplifting event. I'm also putting together some webinars, totally out of my comfort zone but hey! You don't know till you try, right? I would donate toys to a local shelter for kids for the holiday season with the $100. I would use that money to buy more cat food and treats to help feed the neighborhood cats in need. This is such a personal thing. At least for me it has to speak to and from my heart. In our town I would have to choose between a few things: First, we have an abused women's shelter – they are always, sadly, needing funding. It's hard to donate to them though because you can't even search out their address. That would then take me to our local animal shelter – my heart is so broken from the abuse of animals and I know that local is the best way to help out. From there I would likely visit a senior living facility, we have several where we live. I would either buy some things that a director would let me know many of them would enjoy, or pick something out that would have some life to it like a potted plant. I'd buy some items from the wishlist of my local Ronald McDonald House. I would donate the money to Urban Mission, a non-profit organization operating in the inner city of my home city. They help families in need by providing meals a few times a week, providing clothing, developing a sense of community through children's reading circles, ladies afternoon cafe, movie nights, and more, and developing skills through things like parenting support groups and crock pot cooking classes. What a great idea! I regularly donate clothes to charity. What a wonderful posts reminding us we are connected to the world around us. I love the idea of, tending you own garden. We don't have to look very far from our own home to find people in need. Spending a special day with our children or parents, visiting a sick relative,calling an old friend or running errands for a busy new mom on your street. I would donate half the money to the local food pantry where I am also a volunteer. I would take the remaining $50 and divide that into five $10 bills which I would then give to five homeless folks. We have a very large homeless population in my community and many of them either cannot or will not go to the local food pantry. I make donations of personal care items and baby items to our local womens shelter. I’m a health enthusiasts, I run a health blog to help people live a healthy life. For me I could use such money to help the less privilege around me to go for free medical check-ups and screening. Knowing one’s health status counts a lot. I would use the money to buy more school supplies for students at my school. Being at a low income school, our students don't have many of the necessary school supplies that they need. This money would help get them through the second semester of school. I would love to donate this to a non-profit organization, Right Road Kids, so that they can continue their inspiring work with students to help raise their self-esteem and self-worth while guiding them to make wise decisions on the right road in life. Thank you for the opportunity! I would love to win this for my daughters classroom. She has a first year teacher and there are not many books or suppies and this could go a long way for them. I love working with my local animal shelter so I would use it for dog treats. I volunteer at a shelter close to my home and love and appreciate the relationships that I have built there. I love hosting small events for them and would use the money towards creating more care packages for families in need. I would donate extra food to our town's local food pantry. I would use the $100 to purchase supplies for my Kindergarten team at my school. I have known a lot of people close to me that have been diagnosed with diabetes. Krystal’s story really touched me because I do feel like diabetes is one of those “hidden” diseases. You can’t physically spot it but it’s one that can be very deadly if not treated properly. I love that Krystal has become a voice for people with the disease and is really putting her efforts into one location and doing as much as she can there. i would love to use it to buy some supplies for the women and childrens center! Some books for the kids and shampoo and razors, toothbrushes and toothepaste. They need a lot of help. I would use the GC to buy food for my local shelter. I'd use this to purchase some items off the wishlist of our local home for foster children. I teach 3rd grade and have a lot of students who do not have great home lives. I would use $100 up buy them books that interest them that they can keep. Buy groceries for a family in need! I would use the money to add to the libraries of my school. I am a Kindergarten teacher at a Title 1 school so I know new books are always appreciated. I would use it to buy supplies for my Kindergarten team at school. I would donate the $100 to teachers to help them purchase needed school supplies for their classrooms! Thank you for the chance! I’m studying to be a nurse so I love volunteering in my field. I’ve been working with the Red Cross and have learned so much from the people that I have interacted with. I really love helping and working with the little ones. I love surprising them with little gifts to brighten their day or by having little educational parties like trivia days. I would use the money towards the kids. I would use it to buy new crayons and pencils for my class. They love new crayons and pencils and really need new ones.